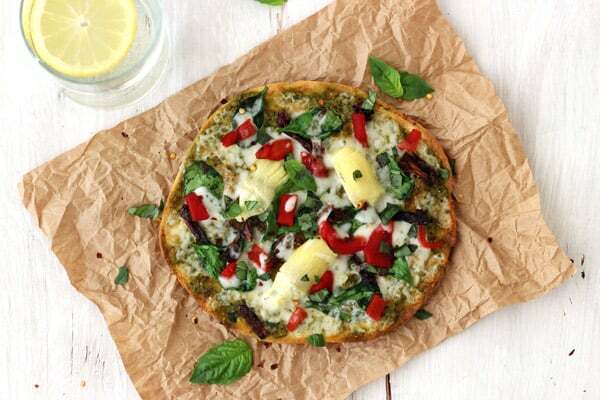 Tortilla Pizzas with Sundried Tomatoes and Spinach have the flavors of your favorite veggie pizza with a lightened-up crust. Enjoy some crispy cheesy deliciousness, and a fun new reason to fire up your toaster oven. Mmm…Cheesy pizza, classic comfort food at its best. But in the spring months with bathing suit season on the horizon and So Cal turning up the temperature dial it’s nice to enjoy a pizza that’s lighter on the thick crust and heavier on the veggie toppings. Plus, with no dough to knead and bake these individual pizzas are a snap to throw together. 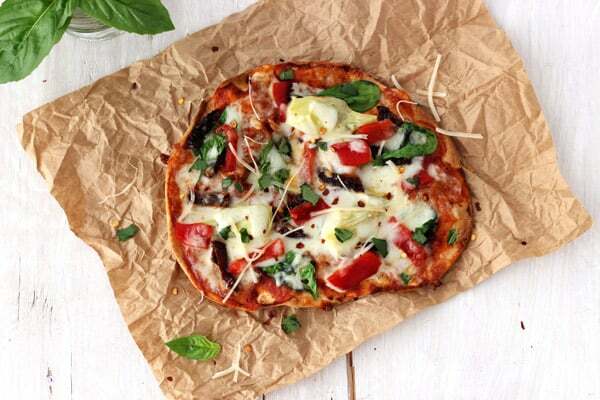 In just 15 minutes you can feast on healthier Tortilla Pizzas with Sundried Tomatoes and Spinach that taste indulgent but won’t leave you with a belly full of bread before hitting the beach. For the lightened-up crust, you’ll need two 6-inch flour tortillas. Use regular or whole grain tortillas, both taste delicious. 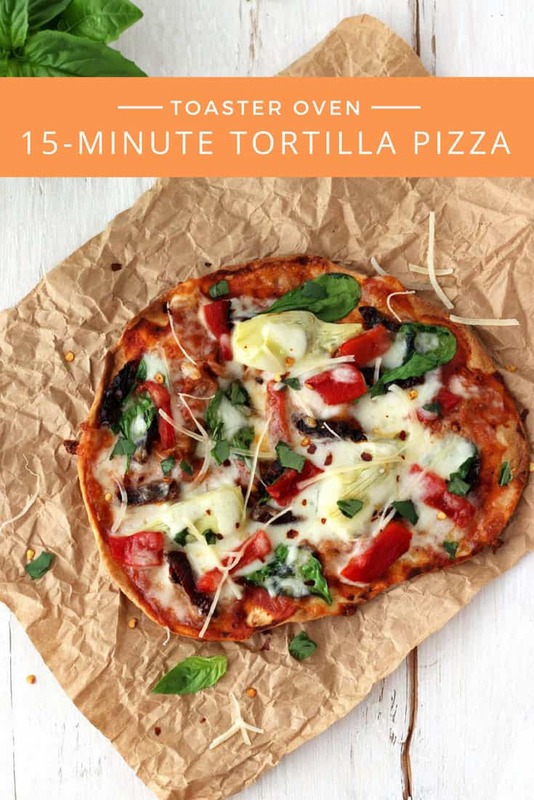 Like baked egg tostadas and veggie pita pizza bites the trick is to get the tortillas super crispy before topping. Just brush them with a little oil and pop in the toaster oven for 4 or 5 minutes. If you’re using handmade tortillas that are slightly misshapen, don’t worry if they overlap a bit. The tortillas will shrink a little as they bake. After a few minutes, they’ll be golden, crisped up and ready to be sauced. For the sauce, make things easy and grab what’s in the fridge. In our house, that means marinara, pesto and if we’ve been making veggie pizza spaghetti squash boats or toaster oven pizza bagels an open jar of pizza sauce too. You really can’t go wrong, Tim even uses tapenade! If we’re making the pizzas with pesto, I usually reduce the mozzarella a little. That way it’s not too rich and the cheese doesn’t overpower the flavors of the other toppings. Fresh baby spinach, tangy artichokes, sweet roasted red pepper and a punch of sun-dried tomatoes. Yep, these are some seriously grown-up tortilla pizzas. But you can “clear the fridge” and add any toppings you want, like leftover Feisty Jalapeño Roasted Cauliflower, Roasted Brussels Sprouts or even Roasted Spaghetti Squash. I mean they’re called Personal Pizzas for a reason. Then it’s time for cheese and a quick trip back into the toaster oven to get everything warm and melty. Finish them off with a generous sprinkle of spicy red pepper flakes (or not) and a few leaves of fresh basil. 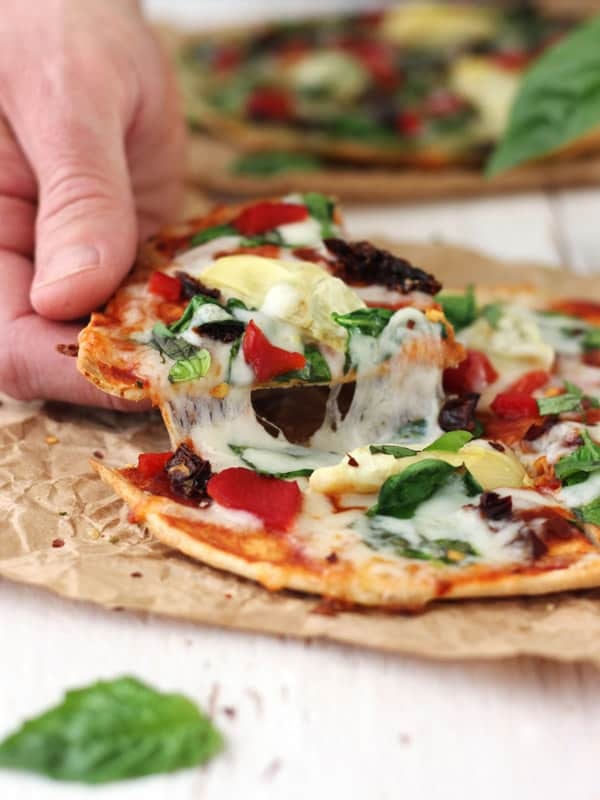 Then get ready to devour the best tasting crispy, cheesy, flavorful Tortilla Pizzas with Sundried Tomatoes and Spinach. Looking for more quick and easy snacks? Check out these Killer Toaster Oven Appetizers That Are Surprisingly Healthy! Just found this site and I’m loving it. 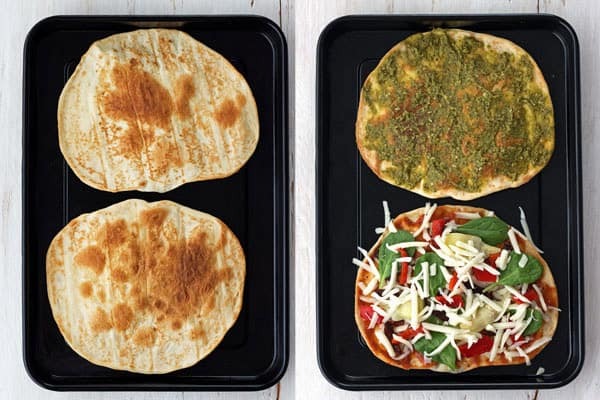 Here’s a suggestion for these little pizzas – I’ve been using my toaster oven for years for my own personal pizzas. But I use wraps – like Aldi’s Fit and Active brand flatbread. They fit almost perfectly (I trim the edges) in the little toaster oven pans and make a nice rectangular pizza. Thanks for the great recipes and ideas! We recently got an Aldi and I’m obsessed with their vegetarian cheese selection. I’ll be on the lookout for those wraps next trip for sure. Thanks for stopping by and sharing your tips! What a great idea! Now I am sorry I didn’t buy the Lebanese flatbread in the Syrian store today, I had them in my hands and then put it back… It would be a great substitute for tortillas I think. I am keeping this in mind, we would all like such a pizza.